As computers become smaller, cheaper, and more powerful, they are turning up in an increasing number of devices. We've grown accustomed to a world full of computers. The majority of American families own at least one. Most of us also own cell phones, all of which contain computers, even if they aren't recognizable as such. Then there are the dozens of special-purpose processors embedded in each of the millions of cars and trucks we drive every day. Computers are even beginning to make their way into the most mundane of everyday appliances, such as refrigerators and dishwashers. All of this is on top of the millions of computers squirreled away in businesses, datacenters, and server farms. Such visions are not as farfetched as they might seem. Nanocomputing experts at MITRE are pioneering designs for building ultra-tiny computers out of novel building blocks like individual molecules, carbon nanotubes, and semiconducting nanowires. Through such designs, computer chips might be made incredibly smaller. It's easy to imagine how nanocomputer chips might be used. For MITRE's sponsors, there is the prospect of greatly reducing the size, weight, and power requirements of their advanced electronics systems. For the wider world, nanoelectronics offers a route forward from Bill Gates' vision of "a computer in every home" to "a computer in every thing." Computing is all about scale. We expect our computers today to solve problems twice as complex as those we tackled a year or two ago using older machines. We also want to continue solving last year's problems, only now more quickly than before and for half the price. Plus, we'd prefer today's computers to use less power and energy than their older counterparts. In essence, new computers are expected to do more with less. These expectations have been met over the last few decades by the scaling of computer transistors down to ever smaller dimensions. The first microprocessor, Intel's 4004, debuted in 1971 and used 2,300 transistors. Nowadays, microprocessors integrate hundreds of millions of transistors into roughly the same space, and there are more than a billion transistors in the chips used in typical desktop and laptop computers. Modern silicon transistors have been scaled down to such a degree that along some dimensions they can be measured literally by counting atoms. Yet along other dimensions, transistors still remain fairly large. 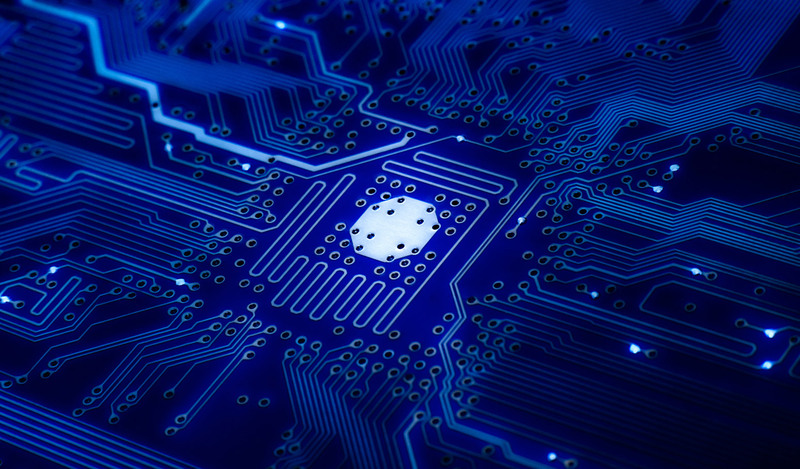 To continue to make denser, more powerful computer systems, entirely new kinds of transistors or novel replacement devices will have to be devised. So how do we make a nanocomputer chip? In an ideal scenario, we might take a modern computer processor and replace all of its transistors with functionally equivalent, yet much smaller nanodevices. Then we simply could shrink the whole system down and use our new, tinier processor in the same way we used the older system. However, it hasn't been this straightforward for a variety of reasons. Foremost among these is that the tools for making transistors are of little use for manufacturing much tinier nanodevices. Specifically, transistor fabrication is based on photolithography, which takes a large chunk of silicon and processes it down to ever smaller featuresbut only so small. In contrast, many proposed nanodevices are assembled from the atoms and molecules up, using techniques from synthetic chemistry. The beauty of synthetic chemistry is that if we can make one device, we can make trillions. Thus, nanocomputers likely will have vast numbers of ultra-tiny nanodevices at their disposal. Conventional computers, which are starting to build up a fairly large device count, make use of these devices by running computations in parallel (e.g., with multiple processor "cores" on a single chip). With exponentially more devices than conventional computers, nanocomputers will need to be massively parallel. The curse of synthetic chemistry is that we have little control over how these devices interact and interconnect with each other. For all the effort we might put into designing a trillion-device nanocomputer, it's likely that, once built, many of its devices will be misconnected or outright broken. This is a far cry from the design of modern microprocessors, where each of a hundred million transistors is expected to be where it is designed to be and do what it is designed to do. Shamik Das, MITRE's chief architect for nanocomputer systems, has been tinkering with computers since he was a kid. He remembers the early models of computers his father would bring home: the TRS-80 with the cassette deck, the Apple IIe. He remembers taking apart the family's IBM PC, opening the case, pulling out chips, and then scrambling to put it all back together again before his father came home. But the benefits of his self-tutelage kept his father from complaining. "Before Windows became popular, my parents were losing track of all the applications we had on the computer. So when I was twelve I wrote a little hotkey-based application manager. My parents thought that was great." Great strides have been made in recent years by the nanoelectronics community toward developing prototype systems that demonstrate both the possibilities and the promise of nanocomputing. To tackle the significant challenges in designing and building such prototype systems, MITRE is working in close collaboration with leading scientists and engineers in academia and private industry. Key to this collaboration is a MITRE-developed systems engineering approach to the design and simulation of nanocomputers. MITRE's methodology is the first to enable the collective modeling of both conventional devices and nanodevices. This systems-based approach has been instrumental in guiding collaborators toward recent successful laboratory demonstrations of nanocomputer components. MITRE continues to work with collaborators to develop and refine designs for novel nanodevices, nanocircuits, and nanosystems in anticipation of demonstrating the first integrated nanocomputers.